On a personal level Joel continues to support his alma maters, Hastings Senior High School and the University of Minnesota, with annual scholarships. Joel is also involved with World Vision by advocating for child sponsorship and helping to raise money to bring clean water to communities in the Bo district of Sierra Leone. The Columns Resource Group was recognized for their fundraising efforts during Childhood Cancer Awareness Month in September 2013. 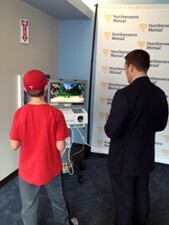 Following an exciting month of raising over $30,000, we were able to donate four Starlight Children’s Foundation Fun Centers™ and three Starlight Tablets to hospitals across Minneapolis. 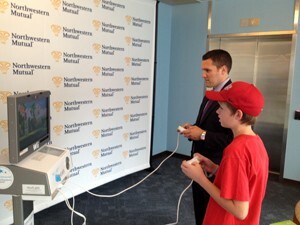 Joel was proud to be able to part of that initiative as he spends time each week volunteering at the Children’s Hospital in St. Paul, MN. The Leukemia & Lymphoma Society's Man & Woman of the Year 2014 campaign raises more than $700,000 to help find cures. 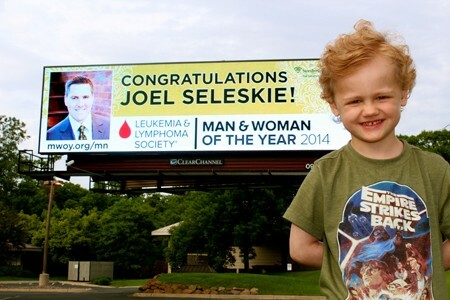 Minneapolis, MN (May 19, 2014) - The Leukemia & Lymphoma Society's (LLS) 2014 Man & Woman of the Year campaign set a new local record by raising $726,347 for blood cancer research and patient services. In its 11th year, 13 candidates participated and collectively surpassed last year's fundraising total by a half million dollars. Three year old Cole McDonough, LLS Boy of the Year, stands before the billboard announcing the Man of the Year for LLS fundraising. 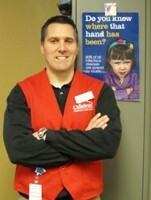 Joel and all of us on his team would like to thank everyone who supported our effort! Thanks to all for helping to fund life-saving cures for cancer and provide access to treatments! Out of all the candidates, Northwestern Mutual Wealth Management Advisor and Woodbury resident Joel Seleskie, and New Ulm resident Amber Melby, a manager of Home Care and Hospice for Allina Health, earned the Minnesota titles of Man of the Year and Woman of the Year.